Syncfusion Essential Studio for WinForms Visual Studio extensions include project template, item template, reference manager, and troubleshooter. 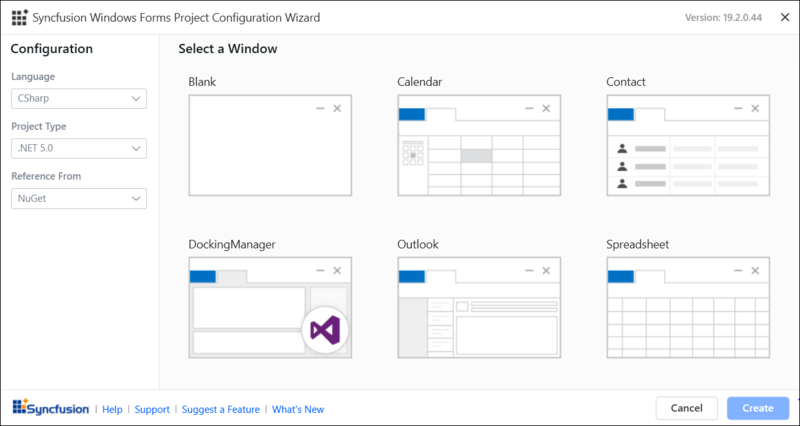 The Syncfusion Essential Studio for WinForms extensions for Visual Studio allow you to create a WinForms project using a pre-built template. The item template allows you to create a fully customized form with a theme. 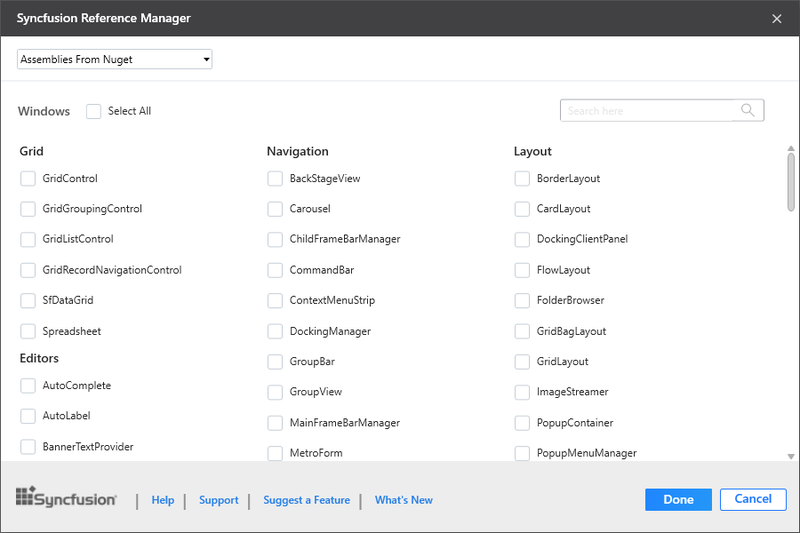 Find and resolve configuration-related issues with the troubleshooter while using Syncfusion components in your Visual Studio projects. •	Over 100 essential WinForms controls like DataGrid, Charts, Diagram, PDF Viewer, and file format libraries. 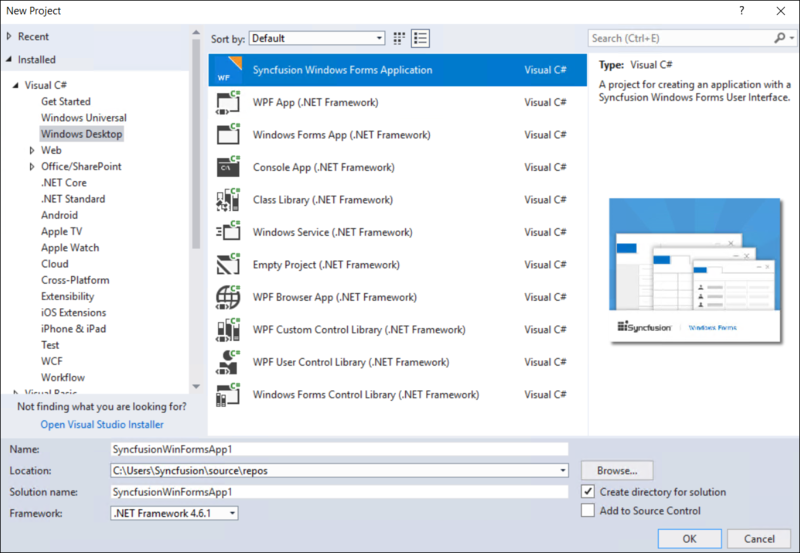 •	WinForms projects are user-friendly and easy to configure with Syncfusion control references (NuGet packages automatically downloaded from NuGet.org, no installer required). 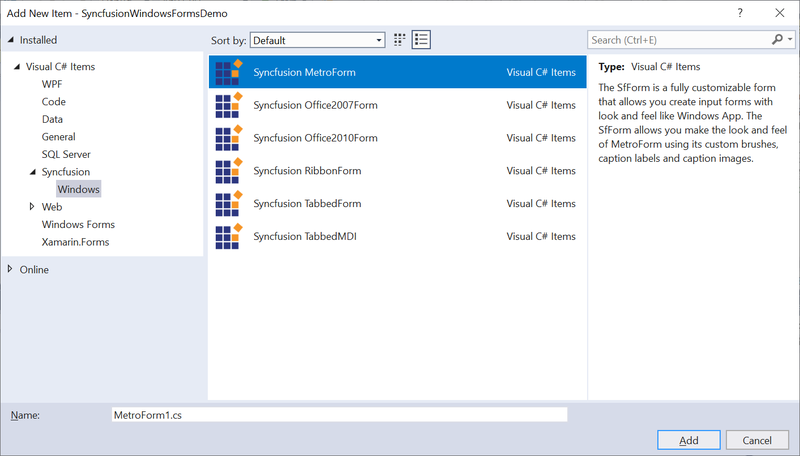 Syncfusion WinForms extensions install the prebuilt template with Visual Studio. This project template allows you to create a new WinForms project with the required Syncfusion references, and then use configurators to customize the projects. You select the language, installation version, and reference assembly location from the installed location, GAC, or NuGet packages. These templates provide a starting point for users to begin creating projects or to expand existing projects. To learn more about the project template, refer to this documentation. Syncfusion WinForms extensions add a fully customized form to create forms that look like they’re from a Windows app. Syncfusion has provided customized forms for Metro, Office2010, Office2007, Ribbon Form, Tabbed Form, and Tabbed MDI for developer convenience. To learn more about the item template, refer to this documentation. The reference manager is a Visual Studio add-in that allows users to add the Syncfusion assembly reference for a selected control to an existing WinForms application. It can also migrate the projects that contain the old versions of the Syncfusion assembly to newer or specific versions of it. Note: This feature is currently available only in Syncfusion WinForms installer. Try this link to download the WinForms installer. To learn more about the reference manager, refer to this documentation. The troubleshooter is a Visual Studio add-in that allows you to find and resolve configuration-related issues while using Syncfusion components in Visual Studio projects. To learn more about the troubleshooter, refer to this documentation. Founded in 2001 and headquartered in Research Triangle Park, N.C., Syncfusion has more than 20,000+ customers and more than 1 million users, including large financial institutions, Fortune 500 companies, and global IT consultancies.